Hi there! It’s Maryanne from The Little Epicurean. Last week we explored our favorite seafood recipes. 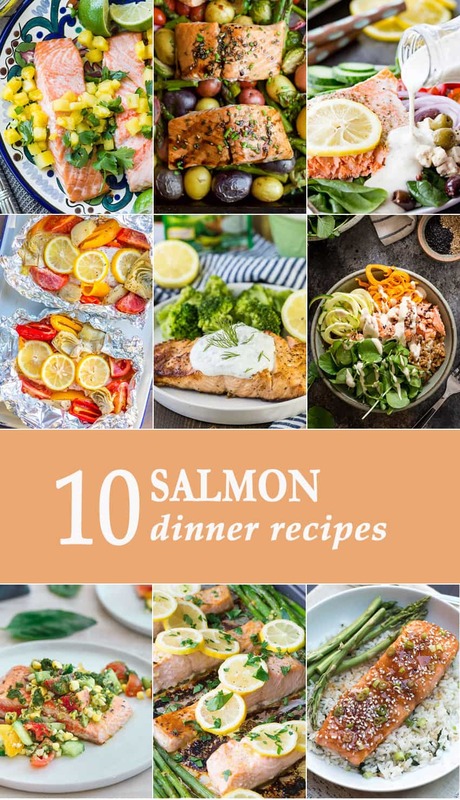 This week we’re focusing on salmon dinners! 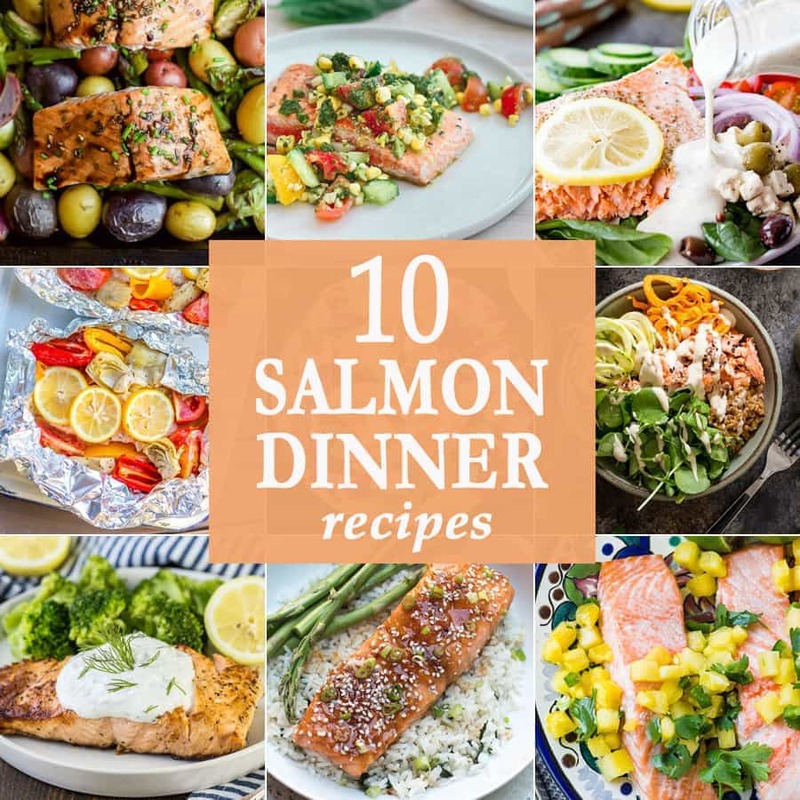 From salads to grain bowls, we’ve got 10 delicious salmon recipes that your friends and family are sure to love! 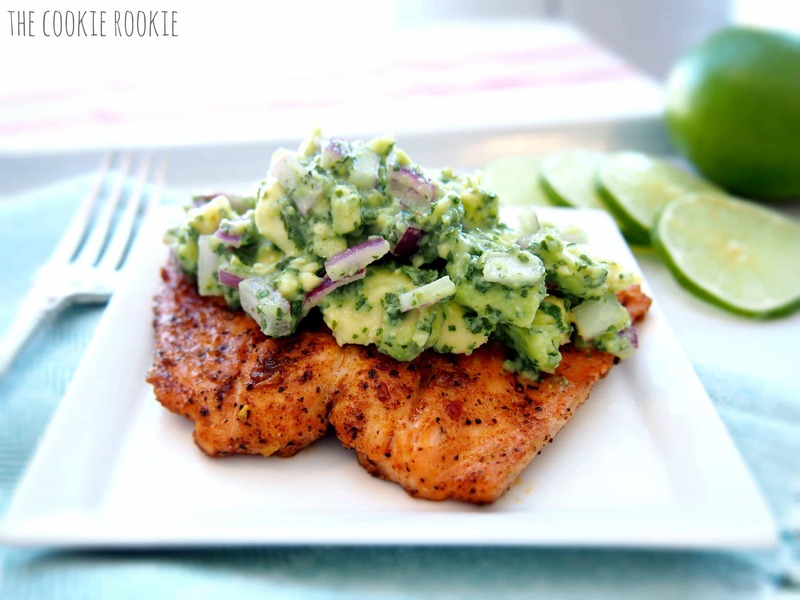 Grilled Salmon with Avocado Salsa (WHOLE 30!) 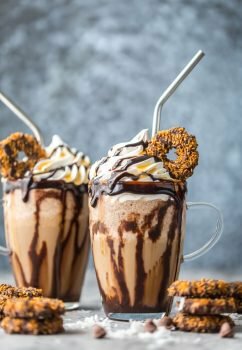 | The Cookie Rookie This incredibly popular recipe is one of our very favorites. SO MUCH FLAVOR so little work! 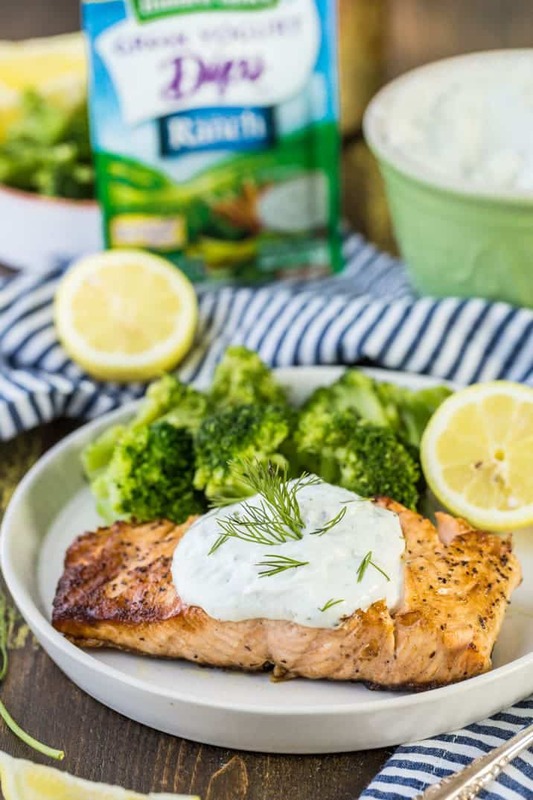 Greek Yogurt Ranch Salmon | The Cookie Rookie Ranch lovers rejoice! 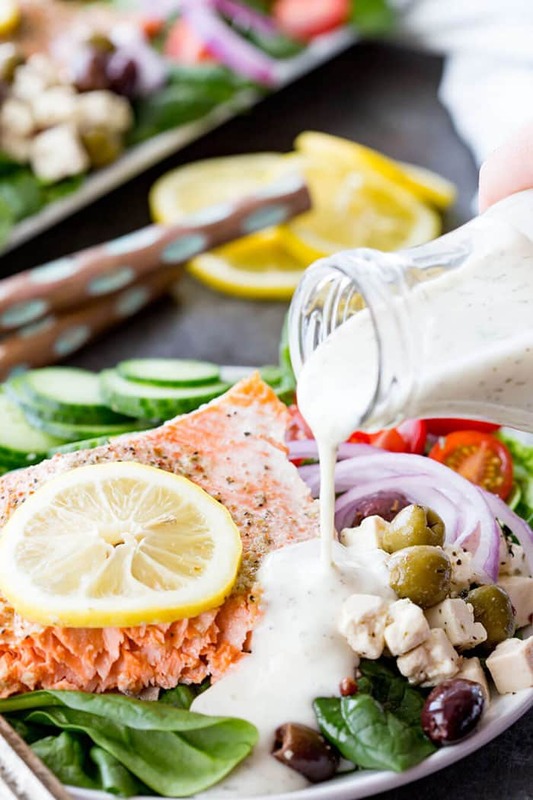 This Greek yogurt ranch salmon is a healthy and delicious dinner you can easily make in no time. 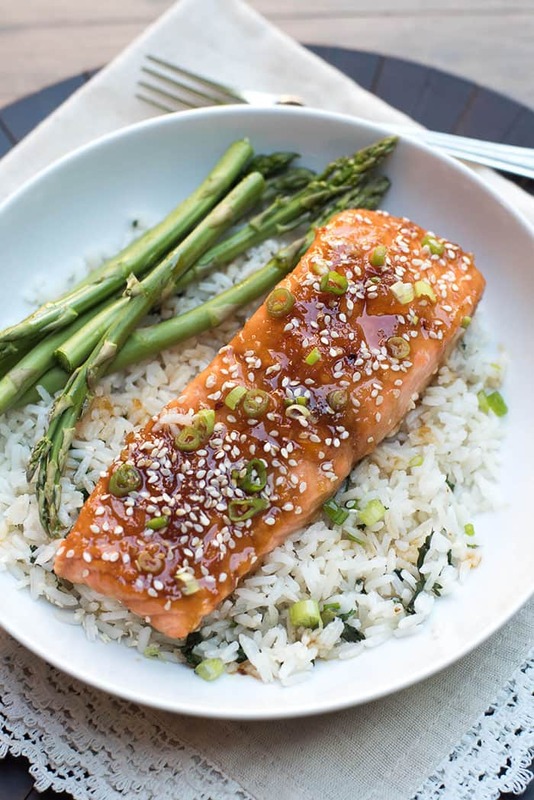 Orange Sesame Ginger Glazed Salmon | From Valerie’s Kitchen Served over rice and vegetables, this orange sesame ginger glazed salmon is a tasty dinner your entire family will enjoy! Grilled Caesar Salmon Foil Packets | The Cookie Rookie Make dinner cleanup a breeze using foil packets. Cooking is even easier when you use the grill. 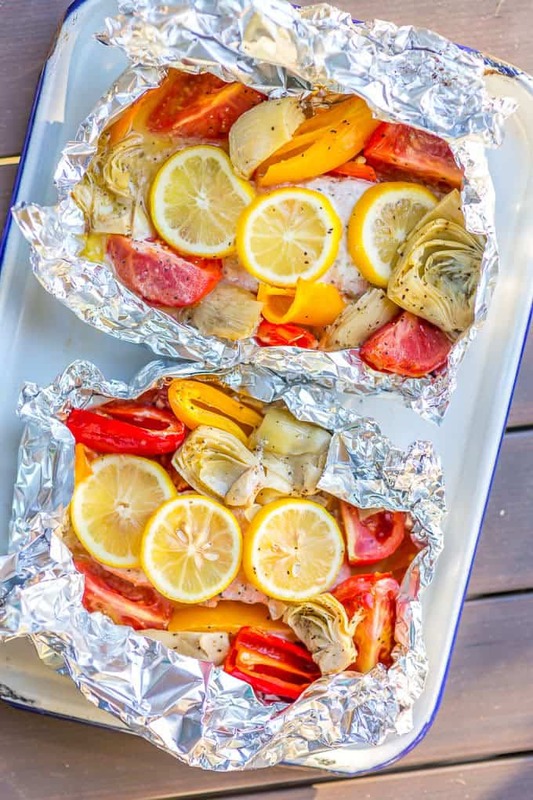 These grilled caesar salmon foil packets are perfect for summer! 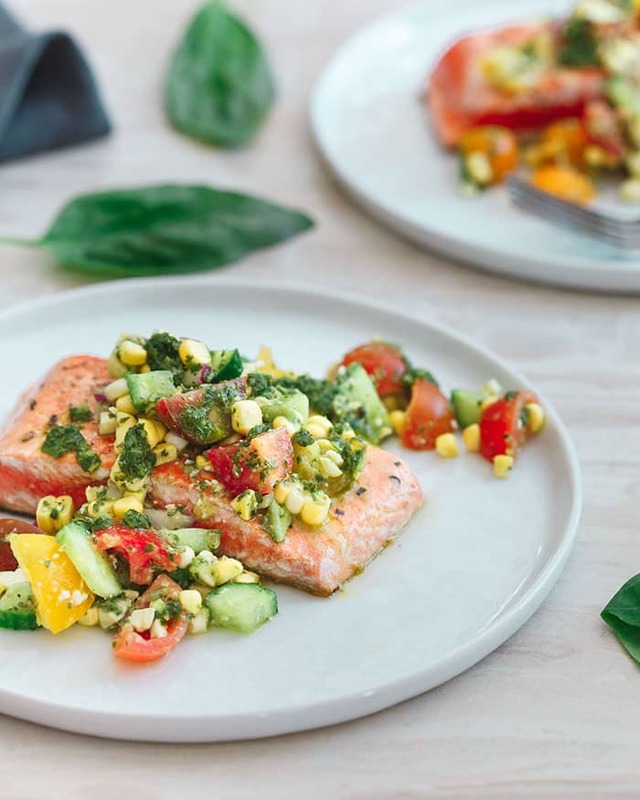 Seared Salmon with Tomato Corn Salsa | Running to the Kitchen This is the ultimate in summer salmon dinner. Seared salmon with tomato corn salsa topped with basil vinaigrette. What else could you want? 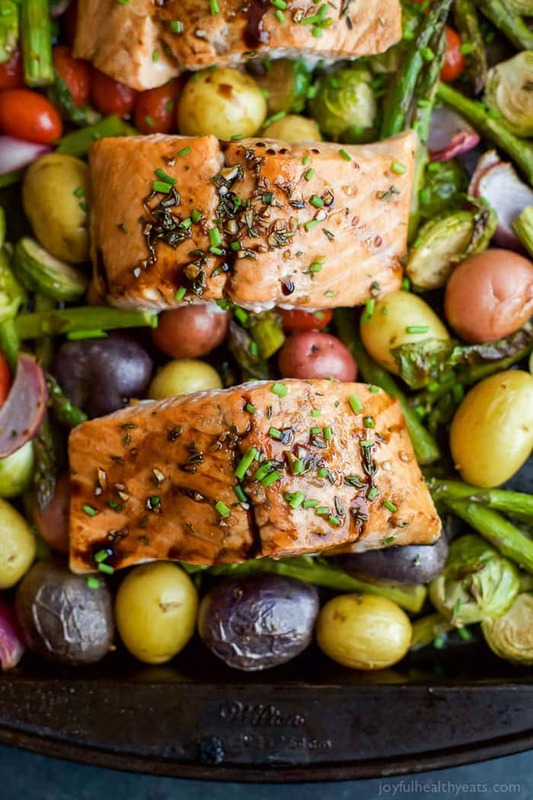 Sheet Pan Balsamic Salmon with Asparagus & Brussels Sprouts | Joyful Healthy Eats Bold, hearty vegetables and deliciously flavored salmon all together in one sheet pan dinner. 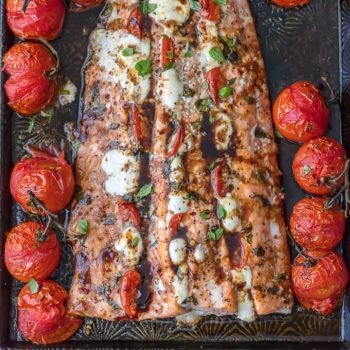 This balsamic salmon recipe is one you’ll be enjoying all year long. 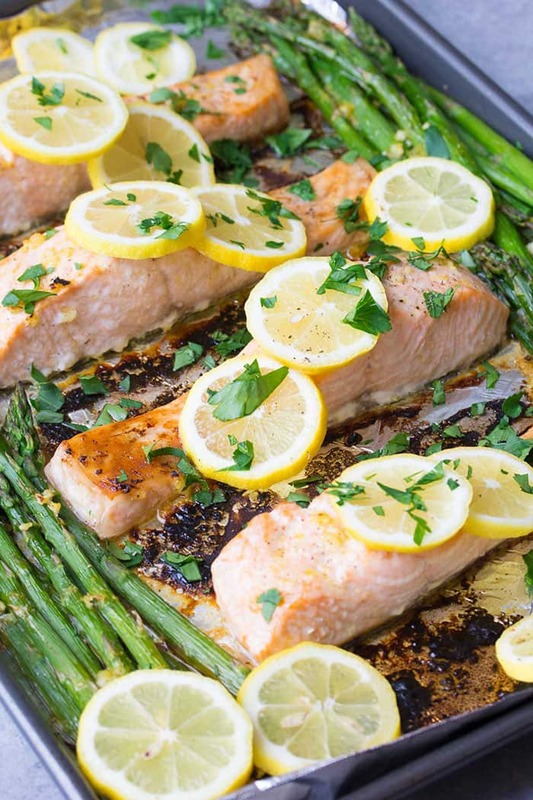 Sheet Pan Lemon Garlic Salmon and Asparagus | Kristine’s Kitchen This sheet pan salmon dinner comes together in 30 minutes. That means more time enjoying the company of friends and family. 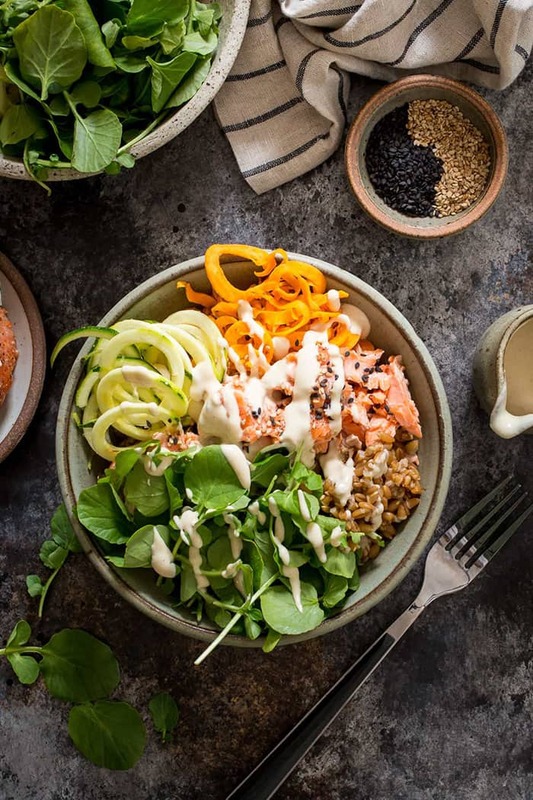 Salmon and Watercress Grain Bowl with Sweet Potato and Zucchini Noodles | Girl in the Little Red Kitchen Add some variety to your dinners with grain bowls! Pair this pan-seared salmon and creamy tahini with your choice of grains: brown rice, quinoa, farro, millet, etc. Easy Greek Salmon Salad | Eazy Peazy Mealz Add salmon to Greek salad for one tasty and refreshing meal. Loaded with a variety of different textures, this salad will definitely keep your tastebuds happy. 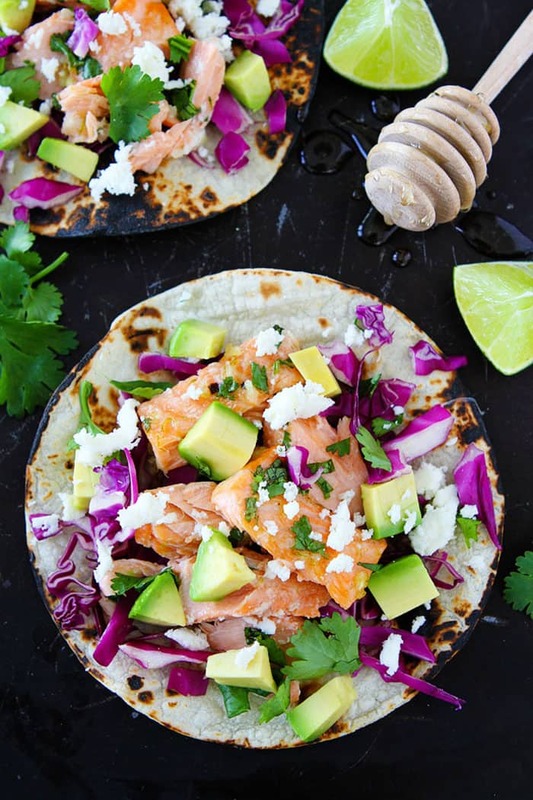 Honey Lime Salmon Tacos | Two Peas and Their Pod Get ready for Taco Tuesday with these honey lime salmon tacos! They’re colorfully delicious. 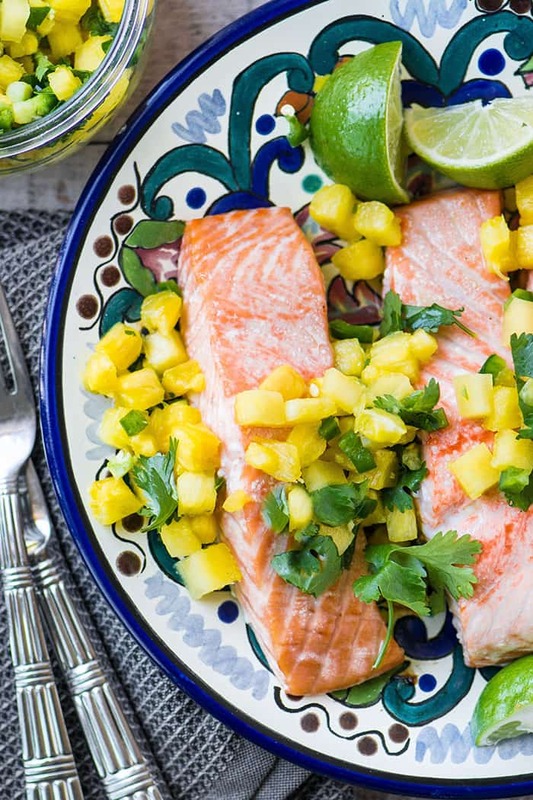 Salmon with Pineapple Jalapeno Salsa | The View From Great Island This light and healthy salmon dinner will keep you beach body ready all summer long! Eazy Peazy Mealz Add salmon to Greek salad for one tasty and refreshing meal. Loaded with a variety of different textures, this salad will definitely keep your tastebuds happy.